It may have come around a little too quick for our liking but WOW, is September making some sweet skateboarding promises… Check out our guide for the month, with skate jams & comps happening every weekend!! The first Friday of every month the ladies of London gather at Bay Sixty6 on Acklam Road for a girls only shred and this month we will be joining them! Come along for an evening of skateboarding and meet loads of new friends. There will be a girls competition will be kicking off at some point in the afternoon so get down to watch Lucy Adams, Josie Millard, Wings Chan and more ladies shredding! With music all day and a £500 prize purse, it’s set to be a good one! For more information check out the event Facebook page here! Girl Skate UK teamed up with Revolution Skate Park to host the FIRST ever girls skate jam in Broadstairs. Join us for a full day of skateboarding, fun competitions & spot prizes. Expect the likes of Lucy Adams, Lois Pendlebury, Dani Mellor & Helena Long! Coaching will be available in the first hour to anyone who would like to try skateboarding for the first time, or just to brush up on some skills! Just £10 to skate from 10AM until 10PM! Head over to our Facebook event page and join us! 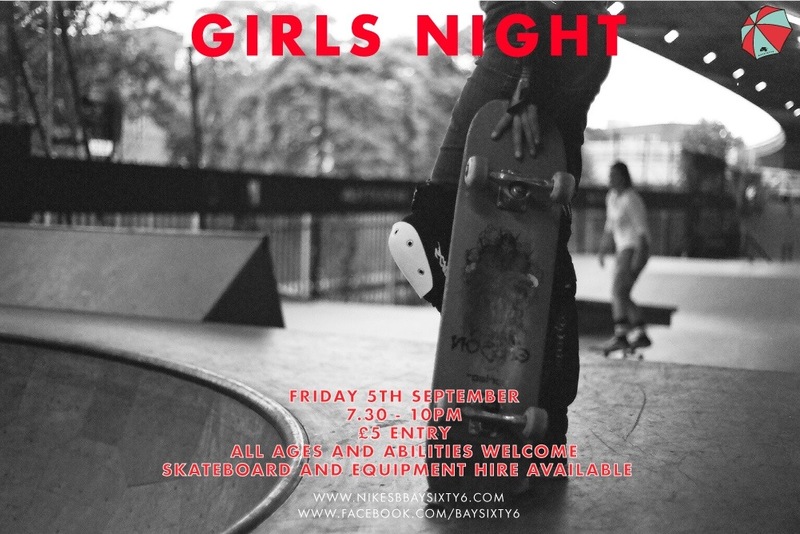 Rush skatepark in Stroud, Gloucester will be hosting yet another girls night! We are told that unless there is a good turnout then it may be the last! Get down to Rush if you are in the area, if we don’t have a presence and support these girls nights they will be lost so it really is important to attend if you can! Head over to the Facebook page for more information. Social Saturday! Head down to The Buszy skate plaza in Milton Keynes at Midday on the 13th September. Get involved in the skate jam, with fun competitions with spot prizes from their sponsors given out throughout the day! Check the website for more info on the days events! 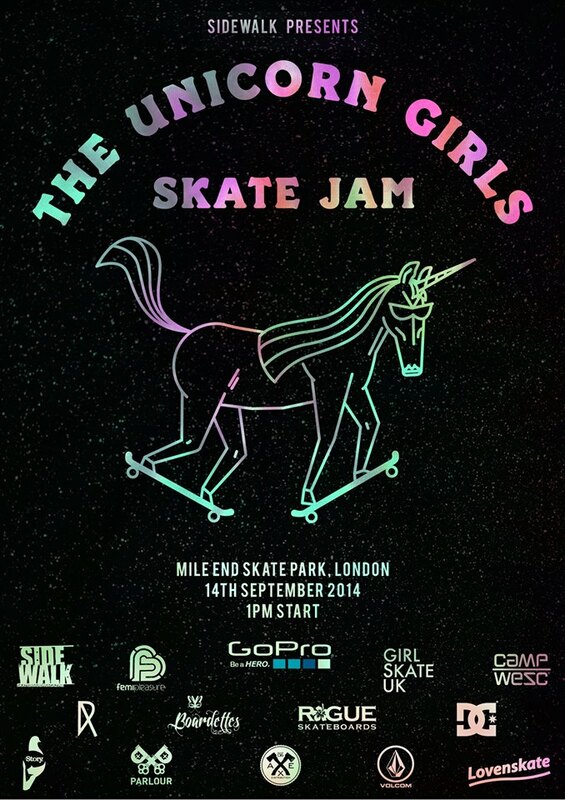 Unigirlz in association with Sidewalk Magazine, Girl Skate UK and Parlour Skatestore would like to invite you to the second Unicorn Jam! The comp will be carried out in two categories, basic and advanced level, followed by a Best Trick comp over the hip and a boys Best Trick comp. We’ll also be holding Graff comp for female artists only! Loads of prizes and a super tasty BBQ with great music throughout the day! See the Facebook page for more info! 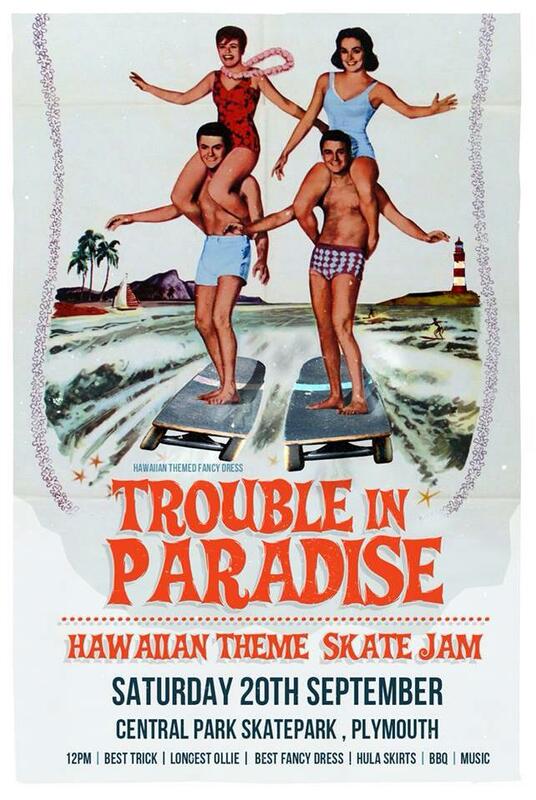 Hula down to Central Park Skatepark in Plymouth at midday and take part in this super fun HAWAIIAN THEMED skate jam hosted by our very own Stef Nurding! For guys & gals of all ages & abilities, you can expect best trick & longest ollie comps as well as a prize for best dressed! There’ll be a BBQ on site so you can get a warm bite to eat apres Skate. We can’t wait to see the photos from this! The LAST THURSDAY of each month sees Pumpcage in Manchester filled with keen ladies of all ages & abilities! Come on down & get involved, but first, watch the edit we made of Julys girls night featuring Marion Fernande, Dani Mellor & more! ← Camp WeSC UK Hull Summer skate edit!